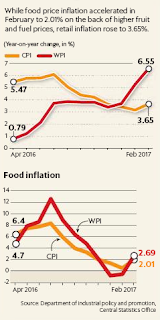 Firmer food and fuel prices drove India's overall inflation higher in February, further dimming any possibility of a cut in interest rate by the Reserve Bank of India amid worries of hardening global commodity prices and expectation of vegetables turning dearer as summer approaches. 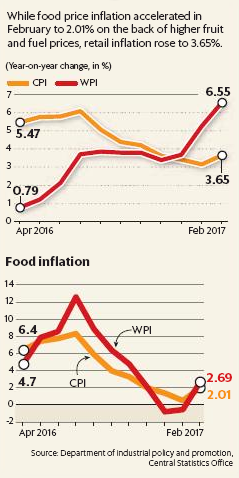 India's headline inflation rate based on the Consumer Price Index (combined) went up to was 3.65% in February compared with 3.17% in January and 5.26% a year ago. 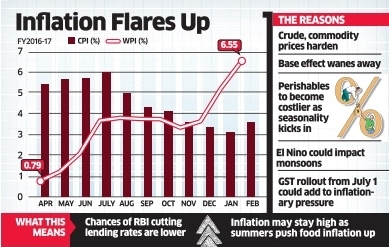 India's wholesale inflation firmed up to a 39-month high of 6.55% in February from 5.25% in January. The increase in prices may weaken the case for an immediate interest rate cut by the RBI, which had kept lending rates unchanged at the last review in February, citing risks to inflation. The next meeting of the monetary policy committee is scheduled for April 5-6. Consumer inflation had touched its lowest level in at least five years in January. Economists are also taking into account Australia's Bureau of Meteorology's forecast of a higher chance of an El Niño forming in mid-2017 and affecting monsoon across the globe.